This is a close up picture of the final launch of Atlantis, so awesome! We all join the countdown from 10 seconds to the sentimental lift off! Then, everyone saw the light as the Atlantis ascended to the sky. Everyone is cheering and in great awe! It was memorable because it was my birthday, I requested my husband that we should go to Port Canaveral and watch the final launch of Atlantis. He was hesitant because he doesn't like big crowds! 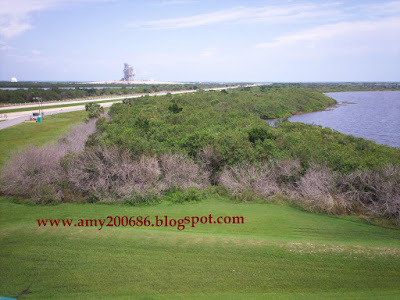 It was believed that there are a million plus visitors who will be coming over to Kennedy Space Center. I tried to explain to him that we could stay in Coco Beach or on the Bridge after the Merritt Island! The picture below is the launch pad inside Kennedy Space Center. If you visit NASA, the tour will stop right where I took this picture. No one can get closer to the launch pad except the employees for safety reasons! I am standing on the LC Observation Gantry where I can view the Launch pad, the crawlerway and the Vehicle Assembly building! 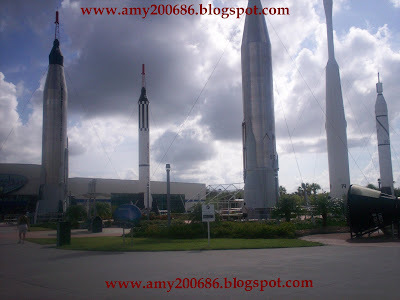 We saw this Rocket Garden even though we are 15 minutes away from Kennedy Space Center. And it's hard to be inside NASA because when you get out, it's not a fun experience. The traffic to get out is terrible and if you have no patience for that, it's not worth it! I was there! I witness the historic event of mankind! I just hope that their mission will be successful and the four astronauts can comeback to earth safely!